DOBOL TROBOL is a hilarious comedy about a passionate cook named Mac who strikes up a very unlikely and riotous friendship with his happy-go-lucky co-worker Arthur. As both hit the bumpy road of their misadventures, the side-splitting companionship they've found might be what matters the most. Dobol Trobol: Lets Get Redi 2 Rambol! 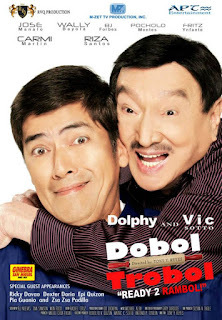 is a Filipino comedy film starring Dolphy and Vic Sotto. The film was a box office success, grossing P90.5 million.